Price of the McDonalds Breakfast Menu - In DKI Jakarta McD fast food restaurants are overwhelming. Almost in every corner of the city, there are fast food restaurants. However, however, I still choose McD as my favorite restaurant. A clean, neat and comfortable place is one reason for me. In addition, the McD menu is very diverse. Although the American franchise initially only served a hamburger menu, with the development of tastes, customers finally served a lot of menus including fried chicken, nuggets, rice packages, fried potatoes, hot cakes, fish fries, chicken porridge, ice cream, and various drinks. Since I am from Indonesia, one of the McD outlets I like the most is McD Ciputat, Tangerang. Nice place, strategic location and very suitable for relaxing with family or friends. The parking area is also wide, so there's no need to worry about not getting to the place even though the restaurant is crowded. Actually, the other McD outlets in Tangerang are also good, but the most suitable for me is the one in Ciputat. The service is fast and friendly. When it comes to the price of the menu, I think it's the same for every outlet. What is clear to me is the price of the McD menu is very affordable. Because only with capital of Rp. 20,000, I have been able to enjoy the delicious Breakfast McD menu, which is a chicken muffin / egg Mcmuffin / sausage Mcmuffin A La Carte complete with a refreshing drink that is refreshing and encouraging in the morning. Imagine only with such a small amount of money, I can enjoy a delicious menu, fast and friendly service and a place that makes me feel at home to continue sitting while enjoying a meal. In my opinion, this is a very profitable offer. 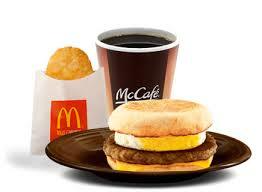 My favorite menu if I visit a restaurant for the Breakfast McD Menu is a cheeseburger and hot chocolate. As for mealtime, I prefer ordering the rice package. However, if I am busy and do not have time to come to the restaurant, I usually use an online messaging service. This service is very easy, by downloading the McDelivery application on a smartphone, then creating an account then logging in for each will use the online messaging service, so I can order the various menus that I want. Orders come in less than one hour, if the conditions are normal. The shipping costs are also standard, same as other fast food restaurants. How, are you interested in becoming a McD customer like me? Please visit the nearest outlet or use the online messaging service and enjoy a variety of delicious menus from McD. 0 Response to "Price of the McDonalds Breakfast Menu In Indonesia"